There is a substantial building with a certain ‘presence’ on the east side of Kenilworth Street which is now the home of many retired people. At its heart is a Victorian building enlivened with patterns of different colours of bricks. Many will recall that in the 1960s part of it was the home of Griffin and Steele, wholesale fruit and vegetable merchants. It was converted and extended as a retirement home with 58 flats by McCarthy and Stone in 1995. A further explanation is needed about the original purpose of the building and the arrival of the name Kinmond in the town. A firm called J Daily and Co was established in 1841 in the town to bottle and sell mineral waters. In 1861 they advertised with an address for their manufactory at 37 Regent Street. 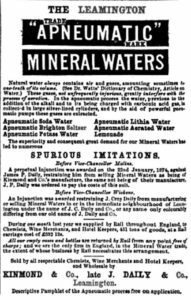 The Kinmonds clearly saw a future in purchasing a mineral water manufacturer in the area and in 1871 they acquired Daily’s business. Kinmond was a family originally from Alyth in Perthshire in Scotland where there were several firms producing aerated waters and suchlike in the neighbourhood. It is perhaps relevant that a present-day market leader, “Highland Spring“. comes from the Ochil Hills in Perthshire. 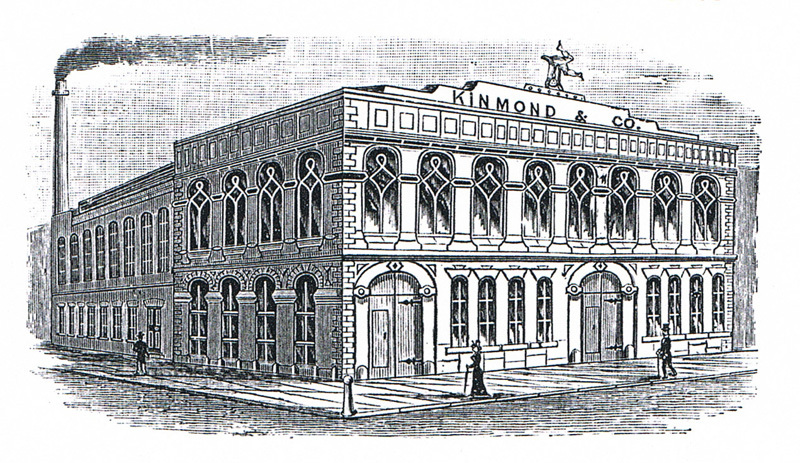 The Kinmonds purchased the beverage business from James Daily of 4 Grand Parade, Leamington for £2,000 in 1871. Dr James Thompson then worked with the Kinmonds to develop a high quality product based on the saline water from the Royal Pump Rooms. Several firms bottled saline waters and made ‘salts’ from them in the nineteenth century. This Trade Mark represents Sancho Panza, servant of Don Quixote, head over heels. It was designed by Mr Daily. At the time of the sale to Kinmonds of the business Patrick Daily (who was using his brother James’s title as J Daily and Co) agreed not to make or sell similar products within 50 miles of the town. In 1873, hardly two years later, he was involved with a company in London and then broke the agreement by using a label very similar to that of Kinmonds in the Leamington area. KInmonds took him to court and won an injunction preventing Daily from setting up in business in the area under any version of his name. 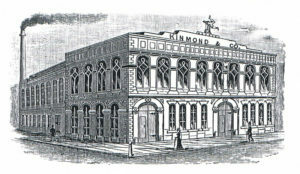 The Kinmonds soon established the business in Kenilworth Street and the premises were substantially enlarged on three occasions. They eventually covered an area of 20.000 sq ft. It was said to be the largest and best arranged of its kind in England. 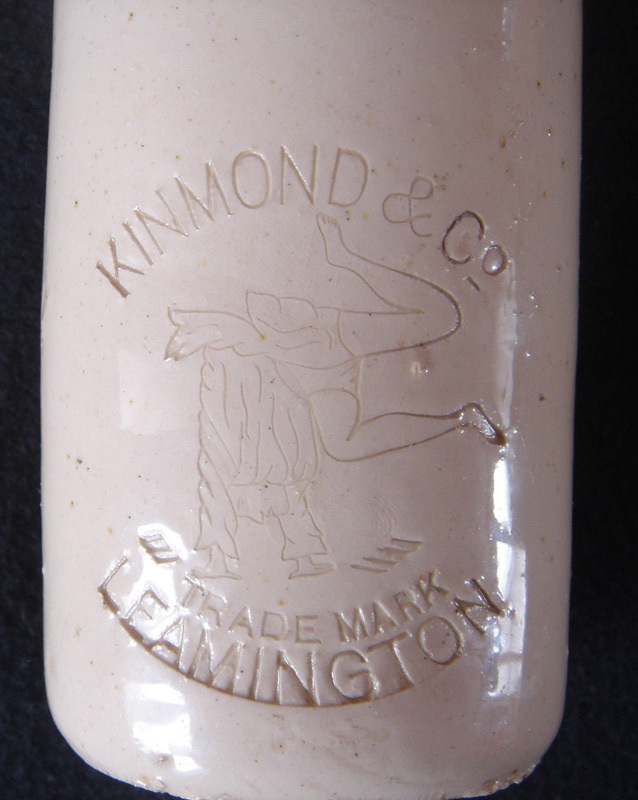 The new company initially styled itself as Kinmond & Co (Late J. Daily & Co) but the words in brackets were scrapped after the successful court case. 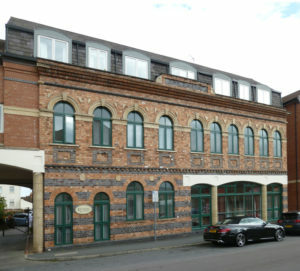 The works had a pleasing and imposing facade of two storeys in an ornamental design of red brick relieved by blue and white facings and extended to a width of seventy feet. The firm adopted many of the latest innovations in science and engineering and they used the “apneumatic” process to exclude air and maintain the purity and quality of their beverages. This was believed to be a great advance at the time. A semi-automatic bottle washing process was also soon designed in-house and installed. The thriving business employed about one hundred people at the peak. The company must have had a flair for marketing because they were soon despatching products to customers all over the United Kingdom and also to many more remote places at all points of the compass including South America, the West Indies, South Africa, India, and almost every colony of the Empire. For the products which were not saline the company had an ample supply of exceptionally pure water from a deep bed of sandstone rock nearly one hundred feet below that from which the saline waters came. 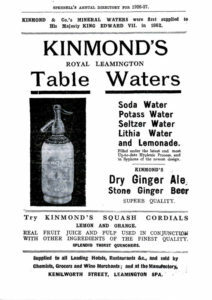 By 1895 their products included Leamington Spa and Brighton seltzers, apneumatic soda water, sherryade, lemonade, aromatic ginger ale, green ginger, ginger beer, orange champagne, fruity champagne, cider champagne, quinine tonic water, potassium water (potassia), sparkling phosphoretta and lithium water (lithia). 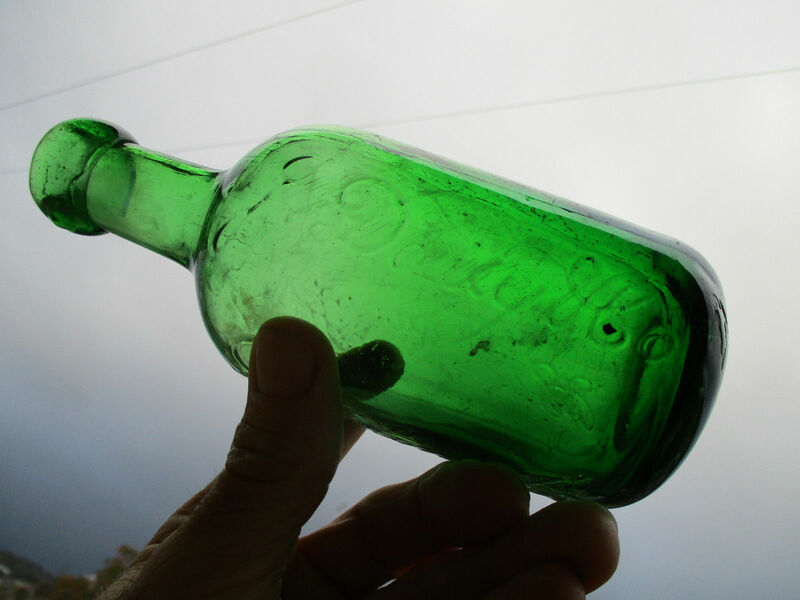 The company was the first to use huge numbers of patent French syphon bottles in clear white glass. The leading light in the business was originally James Crichton Kinmond. JC was born in Alyth in Perthshire in 1841 and died in 1899. When in the area he lived at Milverton. In 1904 his son Captain CSC Kinmond returned home from military appointments and by 1925 he had given up his army career and title and was simply CSC Kinmond, JP (Orkney) with his address at Carstairs, 19 Lansdowne Circus. He assisted his Uncles John (no recorded issue found) and Thomas (who only had two daughters), both by now in their seventies, in the company. By 1935 the Kinmond in charge was CSC, the nephew. 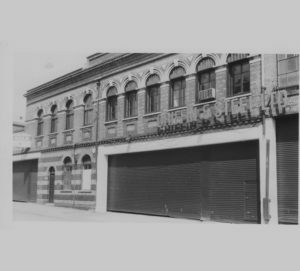 In 1935 Kinmonds and the Leamington Aerated Waters Company, with a factory facing both Chapel Street and George Street, amalgamated and the new company was to be known as Kinmonds Ltd. 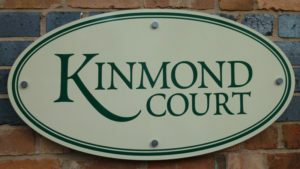 In February there was an advertisement for the sale of the premises at Kenilworth Street by Kinmonds Ltd. Soon after, in April 1936, there was a planning application to reconstruct the warehouse at Nos 21 to 25 for Griffin and Steele, wholesale greengrocers. The entire manufacture of mineral waters was transferred to Chapel Street, and the directories after 1936 list Kinmonds Ltd at Chapel Street/George Street. Two Kinmonds, together with WHC Burgess, sat on the Board of the new company. All employees were retained. 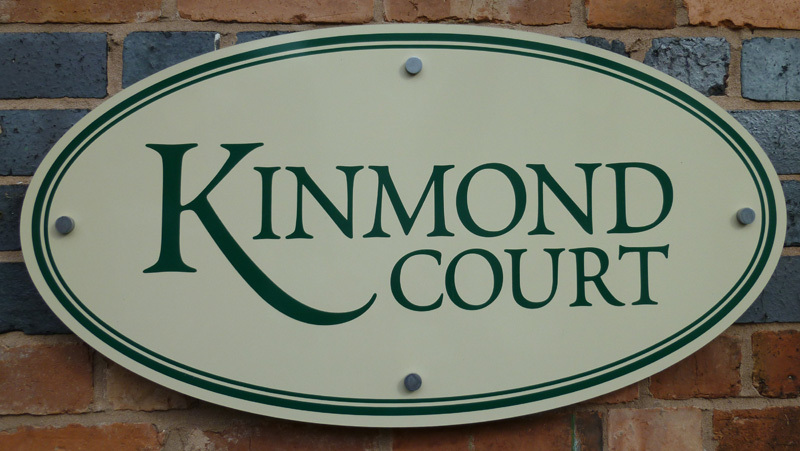 Kinmonds Ltd, ceased to trade in 1963/4, but the name lives on as the name of Kinmond Court, the retirement accommodation, based around the original company building in Kenilworth Street.